Which is your favorite Batman from TV and Film? 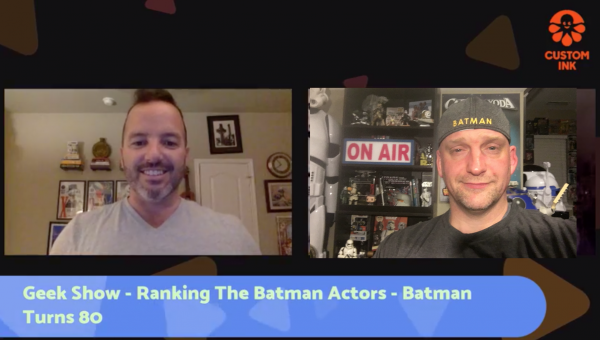 The Geek Show hosts, Art Eddy and Patrick Quinn talk rank the different actors who donned the Cape and Cowl. We can’t wait to see how you rank each actor! Scott Glasgow · Adam West….. I watched the original show as a kid. Haven’t really seen the movies except the one with Keaton. He was great. Wala Smith – Keaton #1, LEGO Batman #2 …everyone else don’t matter. Mike Goetz · Keaton was the best Bruce Wayne. Bale was the best Batman. If you are a Batman fan make sure you check out Detective Comics #1000. As fans across the globe prepare to celebrate Batman’s 80th birthday Saturday March 30, the comic book series that first launched the crime fighting adventures of the world’s most popular Super Hero reaches a milestone today with the release of DC’s DETECTIVE COMICS #1000. With pre-orders surpassing 600,000 copies to date, the 96-page oversize collector’s edition issue features all-star writers and artists paying tribute to an iconic pop culture character, honoring Batman’s first appearance in DETECTIVE COMICS #27 on March 30, 1939.